Wondered how you can find the size of all the files combined together that are uploaded in a particular document library?? Obviously you can find it through code. 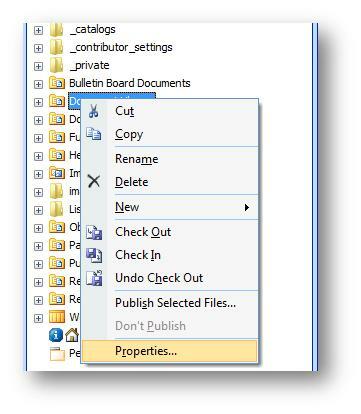 But the simple way is through the SharePoint Designer. Right-click on the document library you want to find the size of. How do I get the size without designer? Is it possible? OOB, its not possible. You may need to write custom code for that..
OOB the designer won’t show the size of the library. The best easy workaround i found is to view the library in explorer view and check the properties. This way you can see the size of the library as any normal folder. This did the trick. Opening the library in explorer view and the looking the property of a particular folder shows the actual file size. As sohil said – We can add file size column and do the Total as sum against the file size column. which will give the Total file size in document library.